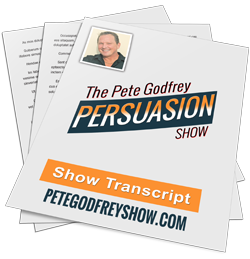 A real pragmatic show this week as I share the 7 steps I go through before writing my copy. It’s these steps that lead to the BIG IDEA! These steps that lets you come up with an irresistible offer. These steps that almost insure your headlines get attention in a cluttered marketplace. And it’s these steps many ignore because they are too damn eager to write the promotion, so they race on through the prep work. BIG mistake. PLUS way too much to mention here. No opt in. Just send me an email and ask for the Cheat Sheet and I’ll send it your way.